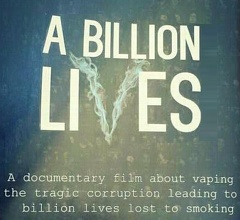 Documentary filmmaker Aaron Biebert is set to stand up for e-cigarettes and the vaping industry by exposing the lies of big pharma and the anti-vaping lobby through a new film called “A Billion Lives.” The movie’s name itself refers to the estimated one billion people who are expected to die as a result of smoking this century. Biebert — a non-smoker and non-vaper — will argue that these groups work together, sometimes in not so honest ways, to keep what he calls “one of the most important health discoveries ever” from saving lives. This is great news for the vaping industry since there is so much conflicting information out there about e-cigs and the impacts to our health. Although the industry got a huge boost though from UK health agency Public Health England earlier this month, which found e-cigarettes to be ’95 percent safer’ than smoking, the public is largely unaware of the benefits and the overall safety of vaping. Some actually believe it’s worse than smoking! That’s where “A Billion Lives” comes in, hoping to end the ignorance and respond forcefully to the naysayers who are trying to demonize vaping. In an interview at the Global Forum on Nicotine in Warsaw, Poland this June, Biebert described what drove him to make the movie. The documentary is currently in production and will not be released until next year. Biebert’s team isn’t waiting to build anticipation though, and those involved are in full swing promoting the film through social media (Facebook and Twitter) and a website, abillionlives.com. “A Billion Lives” will be submitted to Sundance, and if accepted would debut at the festival in late January 2016. “A Billion Lives” marks a whole new front in the fight against the anti-vaping lobby. Vapers have become increasingly proactive and more politically in-tune in the fight for our right to vape. Organizations like the CASAA and the American Vaping Association promote vaping as a safe alternative to smoking and have also begun to lobby lawmakers in Washington, D.C. Even at a local level, shop owners have banded together to share best practices in speaking with the media, ensuring safety and accuracy with their products, and dealing with the anti-smoking lobby. It’s a far cry from the early days, when the vaping industry was much like the Wild Wild West with little leadership and a lack of true direction — preventing the industry from speaking with one voice. With proposed FDA regulations expected to be released later this year, the idea of speaking with a unified voice has become much more important. If the early teases of “A Billion Lives” are any indication, this moment in the history of vaping could play a large part in the movie itself. While initially the film will likely only be seen at film festivals like Sundance, Biebert says the goal is to eventually have it shown in theaters in both New York and Los Angeles after that. A wider release and debut on Netflix or another streaming video service is expected later next year. Cheers from a Norwegian vaper with membership in CASAA, and signing every petition from every Country I spot. @Thor-Vidar Sand, you are very welcome sir. We’re really honored to be a part of telling this story. It’s time for truth.